Some of you might remember the pearl coating we have done some years ago, or even just the E1NS pearl, which was the most important release in association with said coating. After two years of hard work, our anodizing shop finally found a way to further improve their patented coating. We call it Pearl 2.0 or just Pearl since it replaces the previous coating. In fact, it’s a special kind of hard anodizing which has some certain qualities to it. Quote: maximum resistance to abrasion, greatest possible sleekness, maximum hardness/toughness, much increased chemical resistance. According to the anodizing shop this particular coating surpasses similar coatings by competitors up to 30% regarding the quality of the coating features. In the future, more yoyos from ILYY will feature the new Pearl coating. Propably not complete batches, since the coating does not look that fancy, but a small special edition run would always work. At the end Pearl 2.0 is a technical coating, the features are important, not the looks. We have Falcons here taken from the original batch (red/titanium grey CB) which had anodization flaws. That is why we decided to get them re-coated. The original color is still visible at the area right under the bearing and around. As you see, that previous color is still there. And since the masking was done with some kind of lacquer, the result is not 100% clean. Besides that, the Falcons we are talking about are just samples for the new coating. That means, the halves might vary in terms of color nuances. Under a certain lighting condition, the halves might look slightly darker or a shade lighter. Its hard to get it on a photo, but I’ve tried anyway. But as just mentioned, the lighting is different on each half, so, the photo is not really representative. We sell them for 55EUR each plus shipping. International signed for/registered airmail is 5,50EUR. Payable via paypal. If you are interested in purchasing one from me, send raytsh an email, no PMs please. Also, include your full name and shipping address. 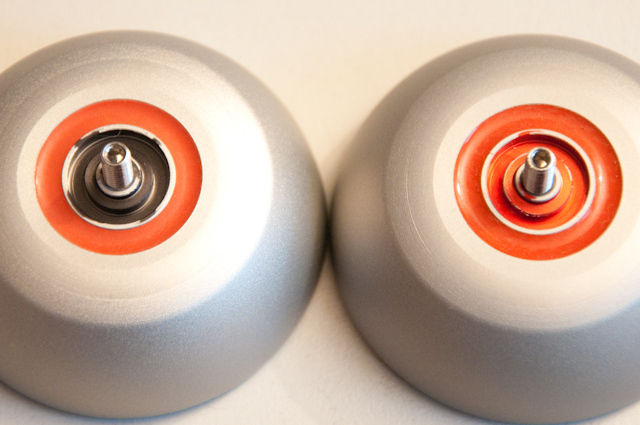 We set the price with the fact in mind, that the yoyos have been recoated, what is noticeable at certain areas (right under the bearing), and that the yoyos are somewhat flawed in this way. They play and perform like a normale yoyo from the original batch though.